A wrought iron pot rack - whether a simple beam or an elaborate, scrolled design - is a practical way of relieving cabinet congestion by using otherwise wasted space, as well as placing well used cooking utensils within reach. While most pot racks are designed to be suspended over a kitchen island or peninsula, still others can be wall mounted where most needed. If you're hanging pots, pans, and stovetop cooking utensils, choose a location that's near your range. If you plan to hang items like colanders, bowls, strainers, whisks, and graters, the pot rack could be useful over a prep area. In both cases, it should be mounted away from busy thoroughfares so no one bumps a head. Hanging pot racks most commonly go over kitchen islands or peninsulas. Other common places are over a sink or counter. Kitchen pot racks do not have to actually hang over anything, although a higher ceiling may be needed in order to ensure adequate clearance of racks in the open. Wall pot racks are terrific between cabinets or below a cabinet between two longer cabinets. Storing pots and pans is a big problem in many kitchens. If you have a small home or apartment you may find that they take up too much room in your cabinets. Your kitchen counter may double as a storage area and you can spend more time looking for the right pot or pan than preparing the meal you cook with it. Even in a larger home, cabinet space is always valuable. And if you have quality pots and pans wouldn't you like to see and enjoy your investment more? 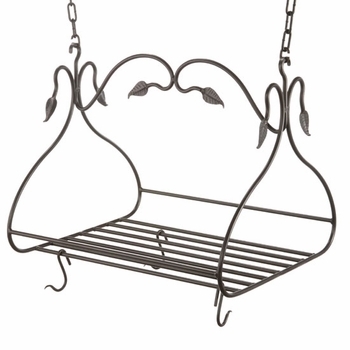 If so, consider a wrought iron hanging pot rack. No longer a novel display of seldom-used copper pots and pans the pot rack has evolved into a staple in today's kitchens. 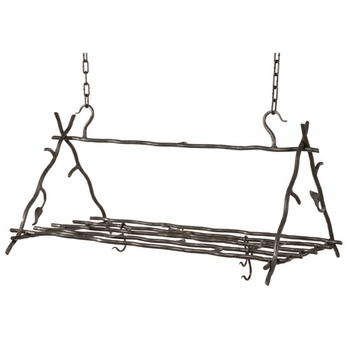 A wrought iron hanging pot rack is a functional way of relieving cabinet congestion, using otherwise wasted space, and housing cooking tools within reach. Both decorative and practical, wrought iron hanging pot racks allow you to organize your pots and pans while adding an ornamental element to your kitchens décor. If you want to expand your kitchen storage and are eager for a stylish new look, a wrought iron hanging pot rack might just be the answer. What do I need to know to choose a pot rack that will work in my home? 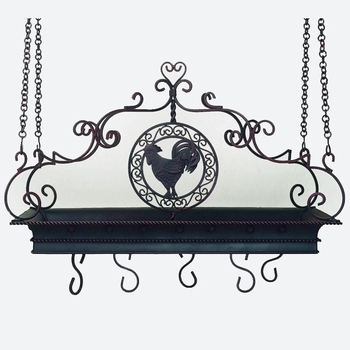 There is a wide variety of wrought iron hanging pot rack styles available, allowing you to select one that will work with virtually any style, shape or size kitchen. The two most important things to look for are that the rack is mounted in the right location and sized to your specific kitchen. Where should I hang a pot rack? If you're hanging pots, pans, and stovetop cooking utensils, choose a location that's near your range. If you plan to hang items like colanders, bowls, strainers, whisks, and graters, the pot rack could be useful over a prep area. In both cases, it should be mounted away from busy thoroughfares so no one bumps their head. 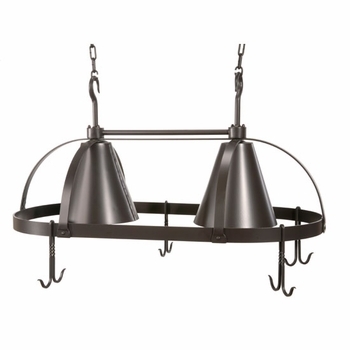 Hanging pot racks most commonly go over kitchen islands or peninsulas. Other common places are over a sink or counter. 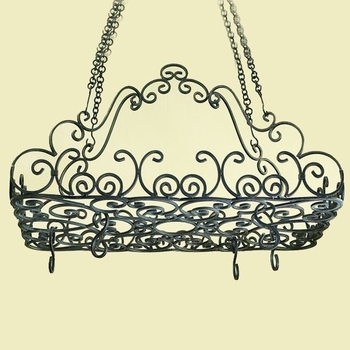 Wrought iron hanging pot racks do not have to actually hang over anything, although a higher ceiling may be needed in order to ensure adequate clearance of racks in the open. Wall pot racks are terrific between cabinets. A) The height of your ceiling; and B) The height of the person using the rack and what a comfortable reach is for them. 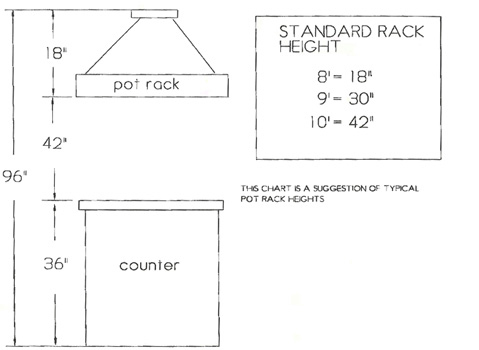 With this information we can figure an approximate height at which the bottom of the pot rack needs to hang. We will assume that you are a 5'4" (64") person. A comfortable reach is typically 6 - 10 inches, so we will add 6" to your height, 64"+ 6" = 70". This is your reaching height. Next we figure how much room is normally used for pots & pans. A small, 2-cup pot is about 8" long; a 12" skillet (with handle) is about 21" long so a general rule would be that your pots need to hang at least 8 inches below the bottom of the pot rack for them to be in reach. So, we add the 8" for pots and pans to your reaching height of 70" and this gives us a 78" height for the bottom of your pot rack. Assuming your ceiling height is 10' or (120"), we subtract the 78" and this would give you a 42" area in which to fit your pot rack. Now you need to find a pot rack you like. 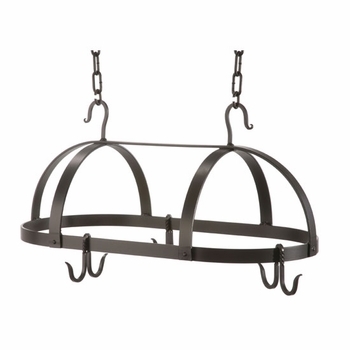 For our example let's say that you want the oval iron pot rack, that is 18" high. Subtract the 18" for the height of the pot rack from the 42" area you have available and this would give you 24" left over. So you would need to hang the top of the rack @ 24" below the ceiling. Important note: Suppose the rack is hanging over a kitchen island. In this case you need to reach not only up, but in. You need six inches of clearance on all sides, so you'll need to add to the distance down you need your pots to hang for you to reach them. 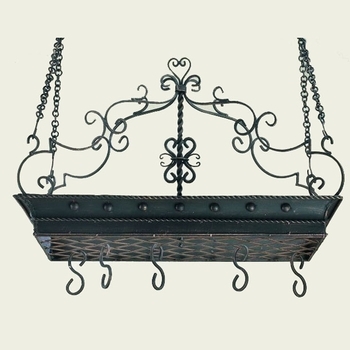 A wrought iron hanging pot rack is heavy, so it should be fastened to the solid wood of ceiling joists or beams. First, locate the ceiling joists with a stud finder. Your chains can be hung at an angle if this will help in your installation but only angle the chains outwards towards the ceiling - never inwards. If your joist runs parallel with the rack then you can mark where you the four ceiling hooks will be located. Make sure it's squared over the island or counter. Pre-drill pilot holes for the hooks then screw them into the joists. If your ceiling joists are not in the proper place to align your pot rack will need to go into the attic to add some 2 by 4's. To do this, mark on your ceiling where the hooks need to go then pre drill pilot holes through the sheetrock from underneath. Push a piece of wire through at least one of the holes then locate the holes in your attic. Then, measure what length your 2 by 4's will need to be, cut them to length, and place them in the attic above the pilot holes. You can then nail your 2 by 4's into place by nailing through the existing ceiling joists into the ends of the 2 by 4's. Two nails about 3 to 4 inches long on each end should be sufficient. Now screw your hooks into the joists. To finish - Hang your chains from the hooks and then lift the rack and hook it to the chains. You have now created more storage space in your kitchen not to mention creating a beautiful focal point to enjoy for years to come. How do I make adjustments if my rack is not a perfect fit? Pot racks are generally designed for a 9 foot ceiling. If your ceiling is lower than this, a low-ceiling rack is your best option. They measure 4" and up in height. If your ceiling is higher than this, the rack will need to be lowered. There are two options for this. One is with chain. The advantage with chain is it is flexible; if you are off in your measurement, you can simply take it up a link to make the chain shorter. The other option is extension hooks, which come in different lengths. Please note that on some pot racks, chain and extension hooks are considered accessories and need to be added to your purchase.